Keep your Chihuahua healthier by spaying her. 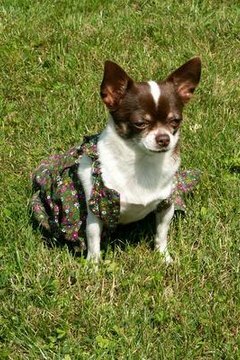 Your Chihuahua is your best friend, and you want her to be healthy for years to come. One of the most important steps you can take to keep her in good shape is to have her spayed. Non-spayed Chihuahuas face several health risks that can be lessened or eliminated by spaying. The most obvious risk for a non-spayed Chihuahua is pregnancy. Small dogs often have difficult pregnancies, especially if the puppies are fathered by a larger dog. Your Chihuahua could have life-threatening complications during pregnancy and birth. Aborting the puppies could also be dangerous, as small dogs have more complications with anesthesia than larger dogs do. Pyometra and cystic endometrial hyperplasia are both uterine diseases. The conditions are related to hormonal changes, usually after a heat cycle. Bacteria, especially E. coli, grow rapidly as the lining thickens. This can cause a life-threatening infection. Many veterinarians compare pyometra and cystic endometrial hyperplasia to acute appendicitis in humans. If an afflicted dog doesn't have her uterus removed immediately, the infection is usually fatal. Non-spayed Chihuahuas are at risk of developing uterine and mammary cancer, especially as they get older. If a puppy is spayed before her first heat, her risk of these types of cancers is almost completely eliminated. Uterine and mammary cancer are treatable when detected early, but often they are not diagnosed until after the cancer has spread to other organs and has become life-threatening. Female dogs in heat often run away and roam, looking for male dogs. Although no dog is safe roaming alone, small dogs such as Chihuahuas are at a greater risk. Because they are so small, they rarely survive being hit by a car. Their size also makes Chihuahuas easy targets for larger dogs and wild predators. Jim Young, DVM: Why Is It Important to Spay Your Dog? When to Spay a Cat? When Do Unspayed Female Cats Usually Go into Heat? Can Spaying a Kitten Help With Temperament? Does Spaying Your Cat Keep Her From Urinating Everywhere? How Soon After a Cat Goes Into Heat Can She Be Spayed?